are always welcome at our reunions! If you are on Facebook, send a Facebook friend request to Nancy Davin and I'll invite you to the Facebook group. This will be our primary means of communicating reunion details. 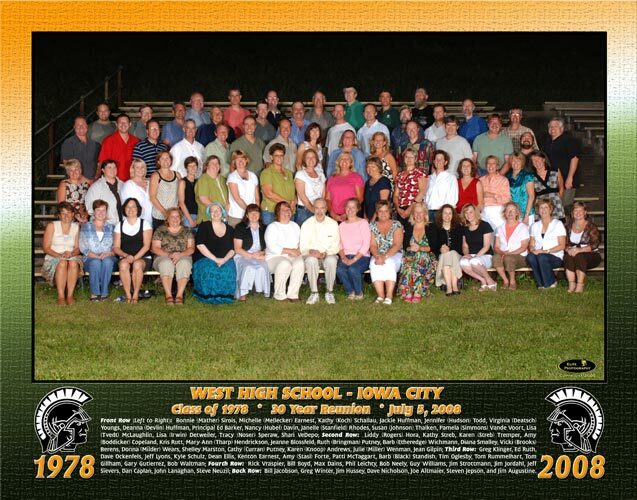 It's also a great way to connect with others from the class and keep up on any relevant reunion or Iowa City information. The group is limited to our class only based on a consensus of the group. To subscribe to the class e-mail list (which is used rarely), send a blank email to IowaCityWest1978-subscribe@yahoogroups.com and you should receive a confirmation. If you have questions, contact ndavin78@yahoo.com. The Missing Persons list changes periodically. Please check it and if you know an email address for someone or know their last known whereabouts, please notify Nancy.